This roast veg power salad is a typical dinner in our home. We love simple and healthy recipes that involve throwing vegetables on a tray, adding our favourite seasoning and just combining everything in a salad. The cajun spice blend pairs perfectly with the creamy avocado pesto. This is a hearty, wholesome and super straightforward recipe. Peel the butternut squash, slice it in half lengthways and scoop out the seeds. Chop it into bite-size pieces and transfer to a baking tray. Trim, peel and chop the beetroot into bite-size pieces, then transfer it to the baking tray. Season the squash and beetroot with pinches of salt and pepper, 1 tbsp of cajun seasoning and drizzle with olive oil. Mix everything together, then place the tray in the oven for 20 minutes. Chop the tough ends off the asparagus and slice them into 4cm pieces. Slice the red pepper into squares, discarding the stem and seeds as you go. Then peel, halve and slice the red onion, roughly 1cm thick. Remove the tray from the oven. Add the asparagus, red pepper and red onion to the tray, season them with pinches of salt and pepper, 1 tbsp of cajun seasoning and drizzle with olive oil. Use a pair of tongs to mix the vegetables in the seasoning, then place the tray back in the oven for 10 minutes. Meanwhile, discard any tough stems from the kale then transfer it to a large mixing bowl. Add 2 tbsp of extra virgin olive oil and massage the kale using your hands for 3 minutes, which will make the leaves tender and soft. Transfer the walnuts to a pan or skillet on a medium heat and toast them for 3-4 minutes. 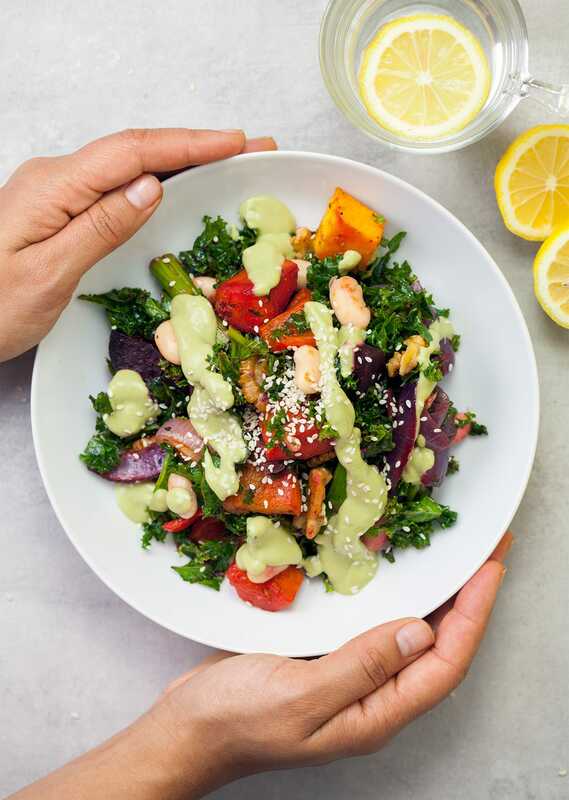 Prepare the avocado pesto by adding the avocado, basil, juice from the lemon, garlic cloves (skins removed), nutritional yeast, maple syrup, pinches of salt and pepper and 250ml (1 cup) cold water to a blender. Then add half of the toasted walnuts, blend until smooth and leave to one side. Remove the veggies from the oven and check the beetroot is fully cooked. It should be soft all the way through. Transfer the beetroot back into the oven for 5-10 minutes if necessary. When all the veggies are ready, transfer them to the mixing bowl with the kale and add the remaining toasted walnuts. Then drain and rinse the tinned butter beans, add them to the mixing bowl and stir everything together. 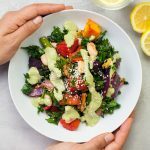 Dress the power salad with sesame seeds and serve with the avocado pesto.